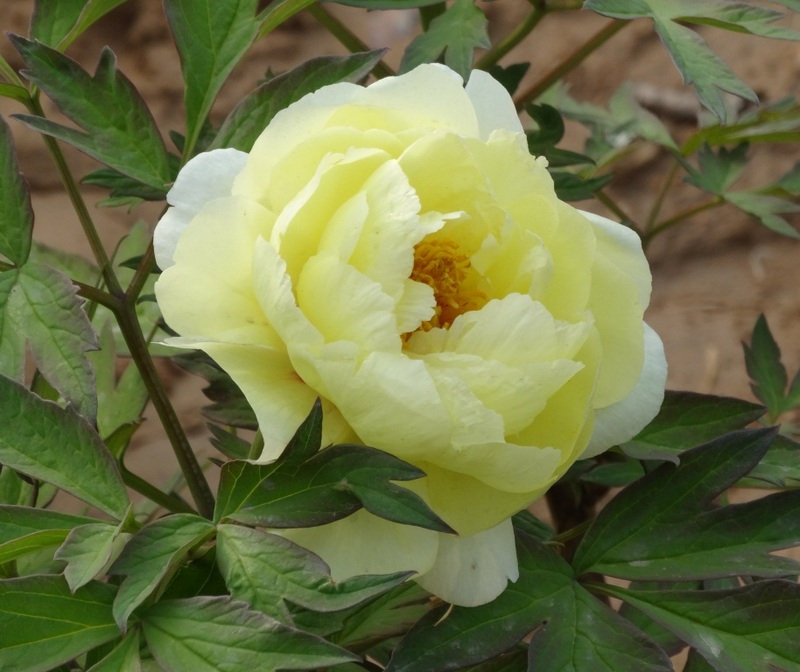 I wasn’t really sure what to expect at the Peony Festival, aside from flowers, of course. 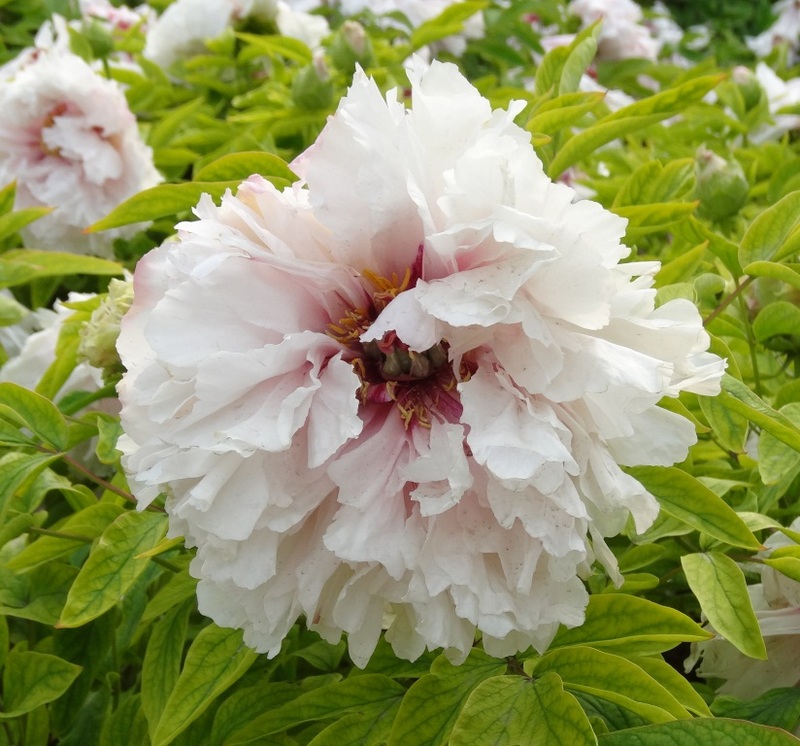 The festival happens every year in the spring time, and in mid to late April is when most of the blooms are out. 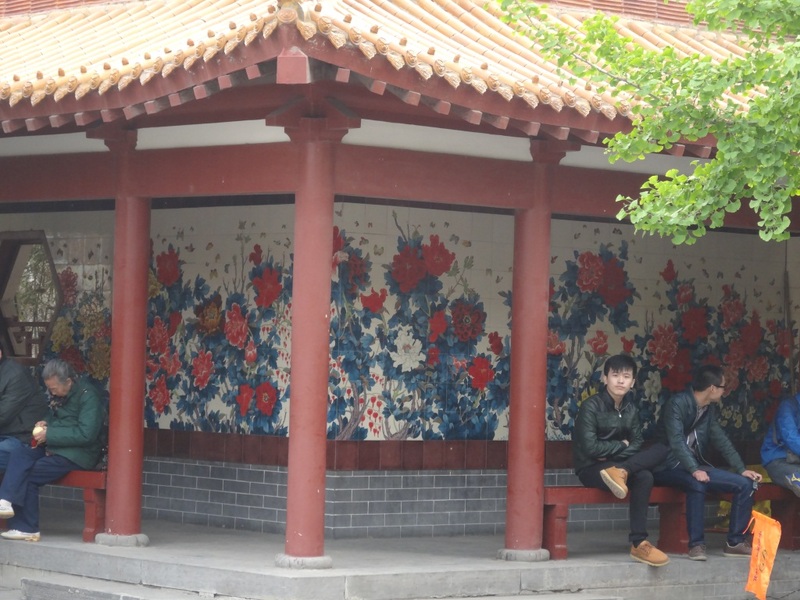 Luoyang is a city of upwards of 6 million, but it’s clear they’ve made a large tourist industry out of the festival. There were vendors everywhere, outside the temples, and inside the festival. 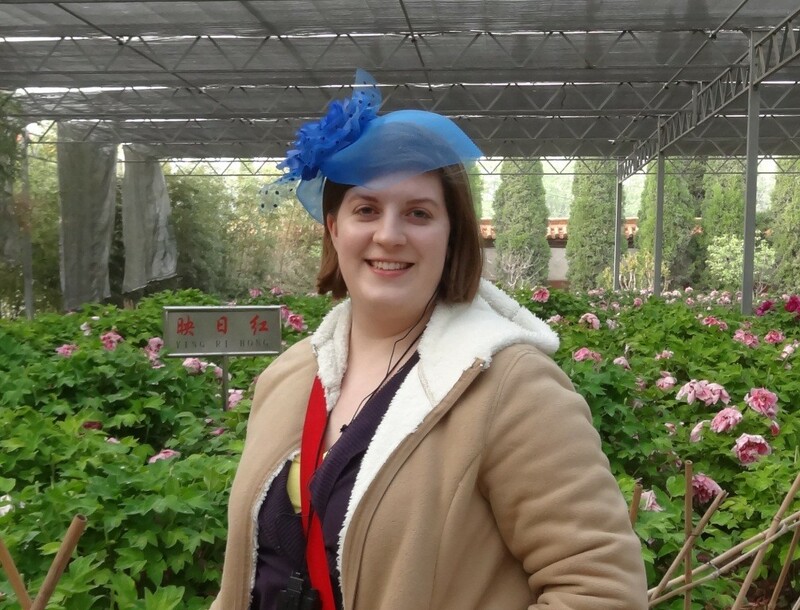 When I visited the Longmen grottoes that morning, I had seen lots of funny hats, and at first I thought, Well, maybe it’s a trend to wear funny hats on tours? Then I saw the vendors and realized all the hats with huge fake flowers were from the peony festival. I really can’t make fun of them too much, because I ended up buying one- I just couldn’t resist! Of course, then I was a foreigner wearing a funny hat, and I ended up in lots of peoples’ family photo albums. At one point, one of the vendors sent her young son over to me to give me a few flowers as a gift. Capitalism aside, the actual flowers were really fascinating. During this week, many different colors of blooms were out, including white, pale pink, bright pink, purple, and even some yellow ones. I couldn’t help but take lots of photos. 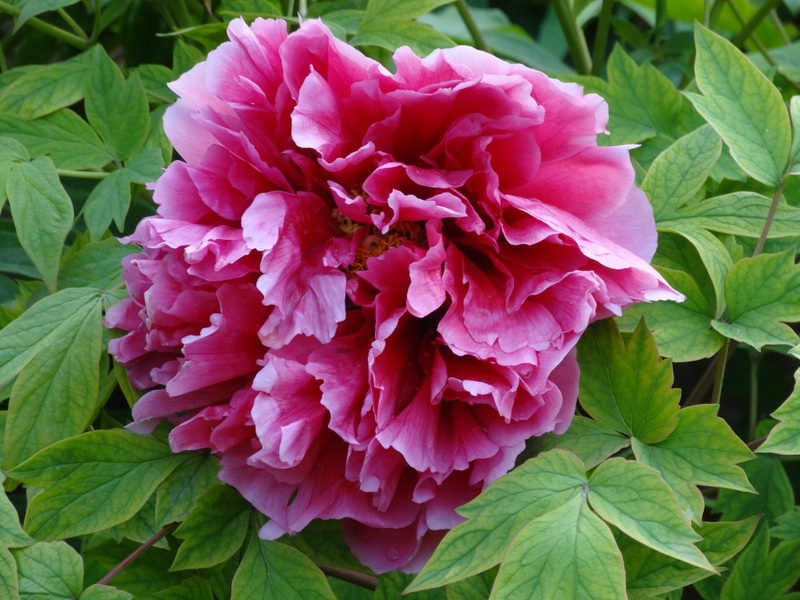 Peonies are quite large blooms, so the stems have to be really sturdy to hold them up. It had rained the day previously, so everything was well-watered. The day I went was very nice, and I even got a little sun burned. I am still thinking of the cold winter days of Beijing over the last few months, I guess I have to adjust back to warm weather! Overall it was really interesting to see how this small place has turned into a tourist destination. The flowers were gorgeous, so if you find yourself in the area between March and May, it’s a fun trip. The festival itself really only takes a couple hours to tour around, so you’ll probably want to look up some other things to do in the area. 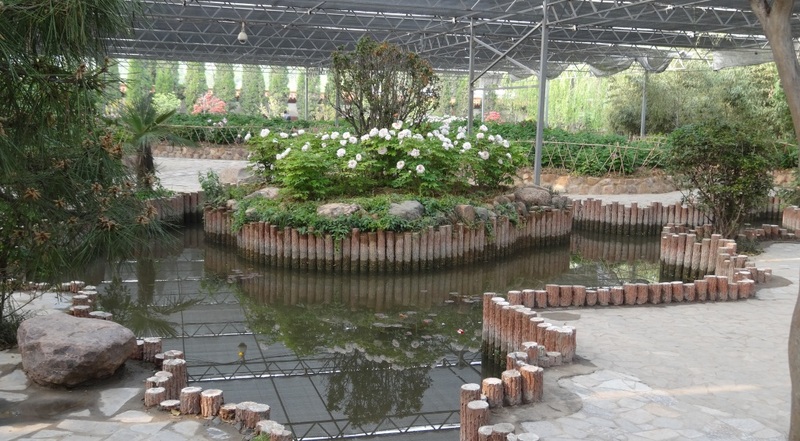 To read what else I did in Henan province, you can read my blog post on the Kung Fu school. 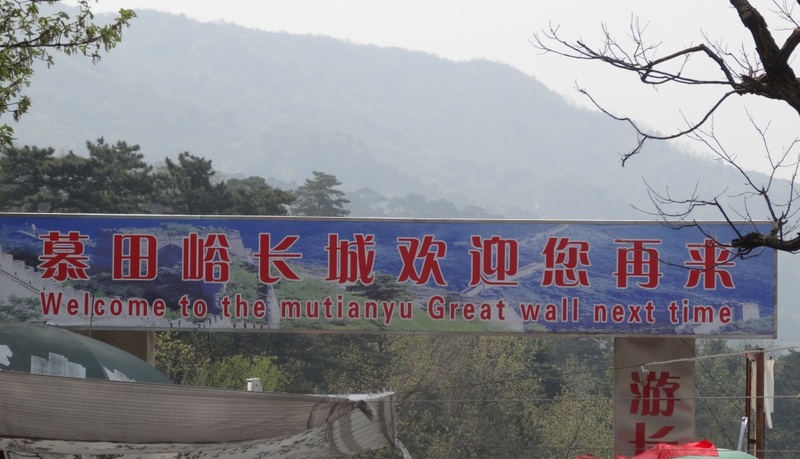 Mutianyu Great Wall in the Spring Time! 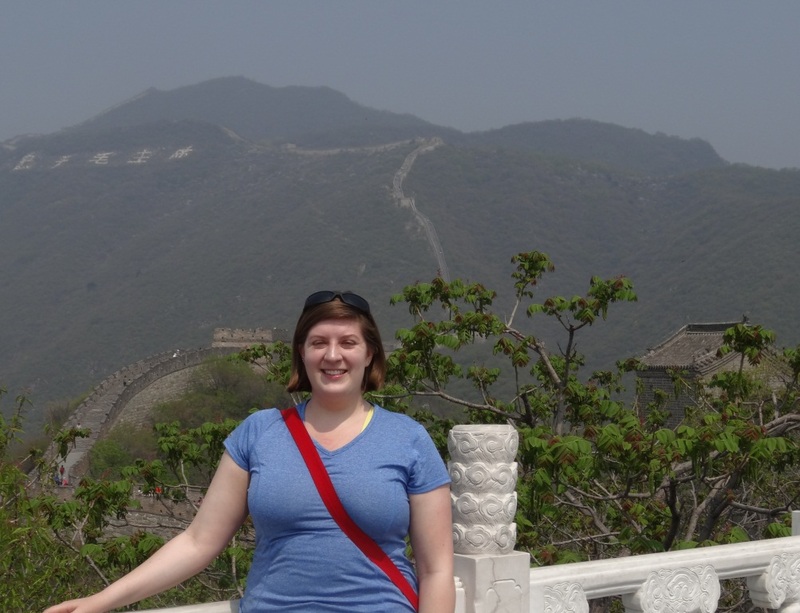 I took advantage of the nice days this weekend for my second trip to the Mutianyu section of the Great Wall. I find this part convenient because it is about an hour (or two) from Beijing, and it is less touristy than other parts, like Badaling. Also, in the spring time you can take cable cars and toboggans. I visited this same part in January and had a completely different experience, seeing the wall covered in snow, and very few people visiting. This time, the weather was nicer, and there were lots of people about. Still, I felt like it was a really nice day, and not as crowded as it will be in June! After buying our entry tickets, my friends and I took the cable cars up to the watch towers, where we could then walk down the great wall. 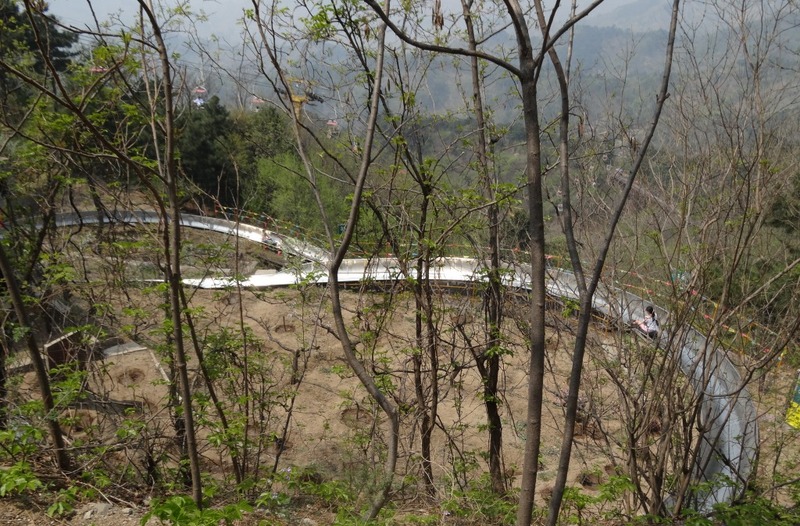 If you don’t want to splurge for the 60 RMB ticket, you can hike your way up, but it’s quite a ways! When I went there in January, we only went to Watch Tower 8 because we had to walk, but today I think we went up to Watch Tower 20-something. Once we were on the wall, it was really nice to look out and see how far it stretched. Luckily, the air quality was pretty nice today (although I’m sure it still qualified as “unhealthy”). 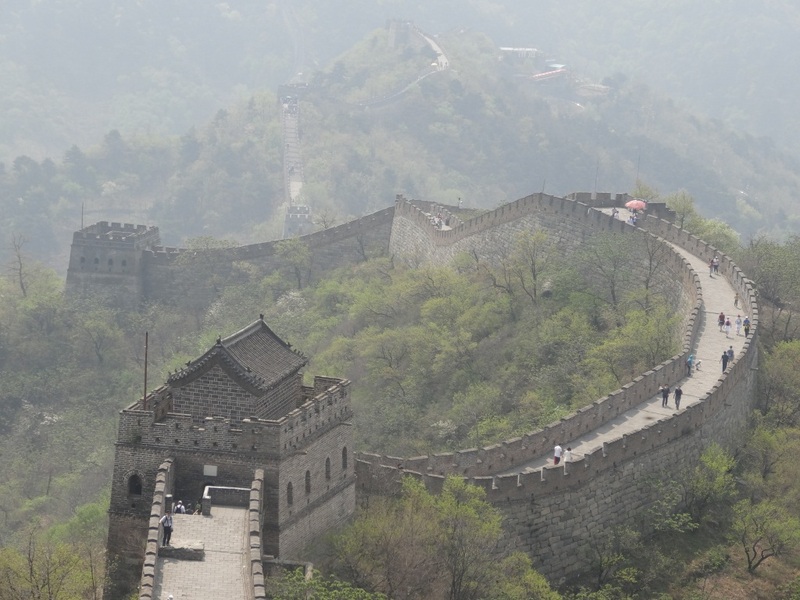 I really enjoyed walking along the wall today because I got to see the area full of vegetation. I feel like we didn’t have much of a spring in Beijing- it went from winter cold to summer hot in the span of a couple weeks. Still, I’m glad the weather has changed, because this means the tobaggans are ready to go! Basically, after walking along the wall for about an hour, we got to ride sleds all the way down. It was a lot of fun, and I highly recommend it! I wish our group had waited a little bit longer, because we were behind another group that was choosing to go quite slow. We would have liked to go faster! Still, we sort of turned it into toboggan bumper cars and had a great time. It probably took about 5 minutes, maybe a little more, to go all the way down on the track. 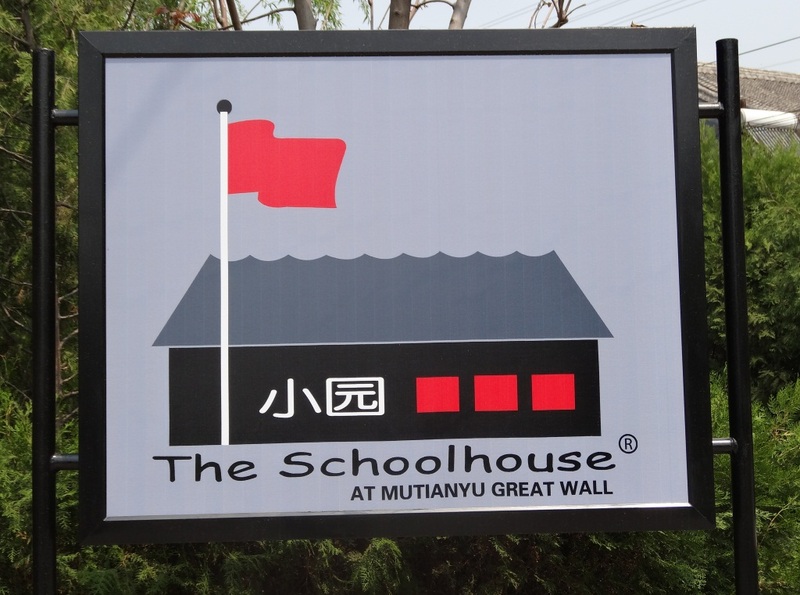 After all the hiking and our mini adrenaline rush, we had worked up quite the appetite, and headed to the Schoolhouse, which is a neat little restaurant right by the Great Wall. They specialize in sustainable meals, and grow a good portion of the produce they sell. Everything was really fresh and delicious, so if you find yourself looking for a meal at Mutianyu, I recommend it! It’s best to make a reservation though, especially if you go in high season (July and August), since it probably fills up with tour groups. 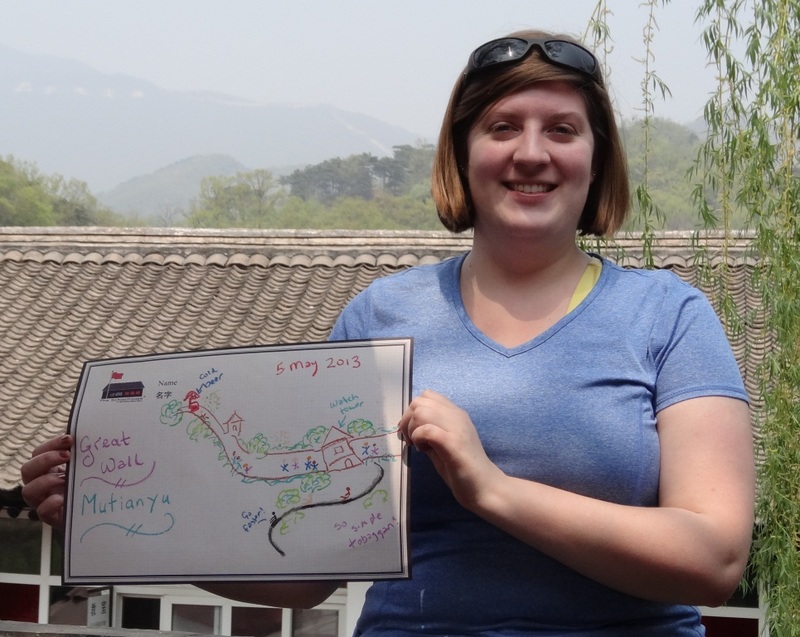 They had crayons to draw on their menus, and I couldn’t help but share my artistic representation of my trip to the Great Wall. In this photo, you can even see the Wall (the real one) in the background! Overall it was an awesome way to spend the day, and I am glad that I live in quick (depending on traffic) driving distance to such a neat historical site!